This study has been prepared for the European Commission (Framework Contract B2/Entr/05/091) and is composed of five sections. The first three sections all deal with assessing the role of skills in the European economy: Section 1 undertakes a number of econometric exercises to analyse the relationship between skills and two indicators of competitiveness, productivity growth and exports. This and the next section represent new research effort in that a disaggregated database (by NACE 2-digit industries) has been used to analyse this relationship. 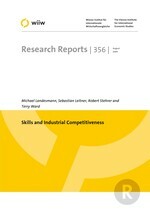 Section 2 extends the analysis towards the relationship between skills and economic growth by analysing the role of skills in the context of a growth accounting exercise where skill changes are separately identified in affecting the 'quality of labour services' and hence the contribution of labour input to value added. Again the analysis exploits the detailed, disaggregated database made recently available through the EU KLEMS project. Section 3 presents an overview of skill compositional changes in different groups of EU economies. We distinguish between EU Northern economies, EU South (composed of Greece, Portugal and Spain) and the New Member States (restricted to only four countries, the Czech Republic, Hungary, Slovakia and Slovenia, for data reasons). In this section aggregate, economy-wide skill upgrading is decomposed into 'within' and 'between' (industry) changes in skill composition and the results show interesting patterns distinguished for more advanced and catching-up types of economies. The last two sections move away from the topic of reviewing the impact of skills on economic performance and the tracking of changing skill demands in EU economies. In section 4, a literature overview is provided of empirical studies regarding returns to skill acquisition through schooling and training. The idea behind this section is that returns to schooling and training reflect both skill shortages and also provide the basis for decisions with regard to skill acquisition. Finally, section 5 presents a country-by-country overview of how information is gathered with regard to skill gaps in different EU economies. The methodologies and sources for assessing skill shortages are reviewed. These are a necessary ingredient into any attempt of designing policies in relation to skill planning and the design of schooling and training institutions. The section closes with a recommendation on useful extension of European-wide vacancy statistics.